A restaurant shooting has left nine people dead, including the assailant, in the town of Uhersky Brod in the east of the Czech Republic. "My information is that there are several injured and about eight dead after the shooter's rampage," Mayor Patrik Kuncar told Czech Television. Czech Interior Minister Milan Chovanec said that attacker killed himself after the shooting spree and was not gunned down by police as reported earlier. The assailant has been identified as a 62-year-old local resident. 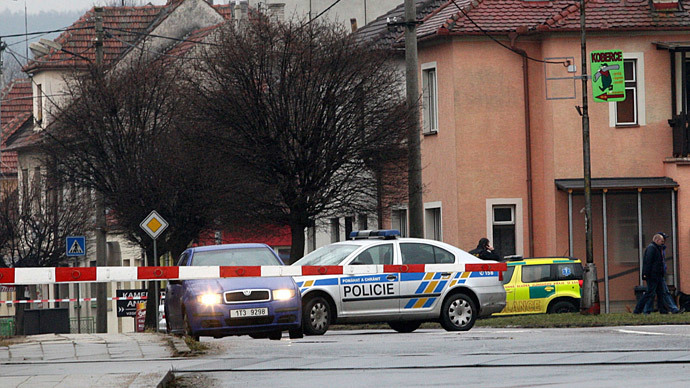 Chovanec explained that the gunman did not have a criminal record or a history of mental illness. The mayor had earlier said that the attacker was "probably mentally unstable." Chovanec stressed that the shootingwas not a terrorist act. The mayor added that the attacker entered the pub around noon carrying two firearms. The gunman reportedly opened fire indiscriminately after storming into the pub, firing about two dozen rounds. One witness, who was in the restroom at the time of the attack, told Czech Television that about 20 people were in the restaurant. Prior to the shooting, the attacker reportedly called a TV reporter who hosts a crime show. The journalist he spoke with called the police. Kuncar said that the gunman acted alone. "I assume this was an isolated incident. I cannot see security measures that would prevent incidents like this,"he said. "We have various anti-terrorist measures but we can see that, here, probably a lone shooter struck with no warning."